PHOENIX – Arizona dove hunters are able to double their wing-shooting pleasure now that the state’s “second” season is underway. Unlike the 15-day season that begins Sept. 1, the late season lasts 45 days and runs through Jan. 6, 2019. There still is a 15-bird daily bag limit, all of which must be mourning doves. The possession limit remains 45 mourning doves after opening day, of which no more than 15 may be taken in any one day. As always, there is an unlimited daily bag and possession limit for the invasive Eurasian collared-dove. A license for youth hunters ages 10 to 17 is only $5. Children 9 and under do not need a license when accompanied by a licensed adult (two children per adult). Licenses can be purchased online at https://www.azgfd.com/License/, or from any license dealer or any department office statewide. NOTE: All department offices will be closed Thursday, Nov. 22, in observance of Thanksgiving. All offices will reopen at 8 a.m. Friday, Nov. 23. Hunters 18 and older must possess an Arizona migratory bird stamp ($5) that can be purchased online, or from any license dealer or department office statewide. Shooting hours are 30 minutes before legal sunrise until legal sunset. One fully feathered wing must remain attached to each harvested dove until it reaches the hunter’s home. Keep in mind that dove hunters are responsible for cleaning up after themselves. Shell casings (shotgun hulls) and associated debris constitute litter and must be picked up and packed out. 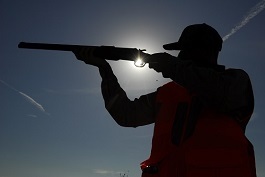 Littering while hunting or fishing are revocable violations, and a conviction can result in the loss of hunting privileges for up to five years. For everything “dove,” visit https://www.azgfd.com/hunting/species/smallgame/mourningdove. As a reminder, AZGFD still is accepting registration for hunters to participate in the Arizona Small Game Challenge, a new concept created in partnership with the Valley of the Sun Chapter of Quail Forever that highlights the state’s abundance of small game hunting opportunities. Every $25 registration will be matched, dollar for dollar, by the Valley of the Sun Chapter of Quail Forever to benefit small game species through habitat improvements such as grassland restoration, planting crops for wildlife and water source development. Desert (harvest five of seven): mourning dove, white-winged dove, Eurasian collared-dove, cottontail rabbit, Gambel’s quail, Mearns’ quail, scaled quail. Mountain (harvest five of seven): Dusky (blue) grouse, chukar, band-tailed pigeon, cottontail rabbit, tree squirrel (Kaibab, Red, Abert’s). Native Quail: Gambel’s quail, Mearns’ quail, scaled quail. Upland Bird: Dusky (blue) grouse, chukar, Gambel’s quail, Mearns’ quail, scaled quail. A hunter who completes his or her first challenge will receive a plaque that includes an engraving plate to mark the achievement. The plaque comes with space for additional engraving plates as a hunter completes one of the remaining challenges each hunting season. The first step is to register at https://www.azgfd.com/hunting/species/smallgame/challenge-info/. The registration fee is $25 per challenge (a hunter is eligible for only one challenge per year). Then go hunting in accordance with all legal requirements, including season dates. Be sure to take a time-stamped photograph of each species harvested for a particular challenge, then visit the website and fill out the verification form to certify the completion of that challenge. All photographs and the completed verification form should be emailed to: wzarlingo@azgfd.gov, or mailed to: Arizona Game and Fish Department, Small Game Program Manager, 5000 W. Carefree Highway, Phoenix, AZ, 85086. Photographs will not be returned. In addition to the late dove season that opens Friday, several other small game hunting seasons already are underway, including quail (Gambel’s, scaled), Oct. 19, 2018-Feb. 10, 2019; cottontail rabbit, July 1, 2018-June 30, 2019; chukar, Sept. 1, 2018-Feb. 10, 2019; and tree squirrel (Abert’s, Kaibab, Red), Oct. 5-Dec. 31, 2018. The season for Mearns’ quail opens Dec. 7 and closes Feb. 10, 2019.